Headlines:Fishing has been good for bait and fly anglers this week and also some nice ones caught trolling too. 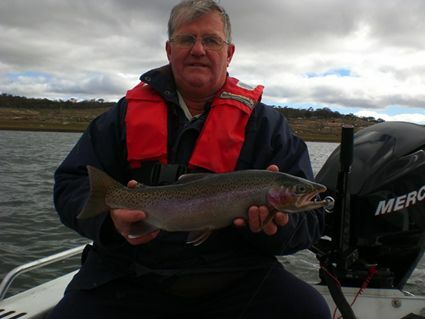 Lake Eucumbene:- The lake has been a little better in the Anglers Reach area with a few good rainbows and browns being taken in the evening. The fish are not coming in for very long, around 30- 60 minutes, but there have been some crackers nearing 2kg being caught. Most are around the 900gm to 1 kg mark. Fish quality has been excellent. There are still enough of those fat rainbows around to keep most anglers happy. *Reports of a local angler named John nearly getting pulled in by one of these big rainbows has surfaced this week. Apparantlly when he went to land the fish it was that big that he did his back in (again). Not sure if this is true but makes a better story than say, tripping over in the dark and doing it. Still alls well that ends well and Mr Mills got a very nice fish. Seven gates produced some good fish off the bank last weekend so fly anglers would do well to concentrate their efforts in that area. Lake Jindabyne:- Jindabyne has been great in the evenings and there is plenty of good polaroiding opportunities when the weather is good. Searching with a woolly bugger will produce a few nice ones or just wander the bank looking for fish and cast a small wet or nymph at any fish found cruising. There is still a heap of weed in many of the bays that is drawing the fish in to the food that it holds. Polaroiding reports have been scarce but there are fish poking around so if you get the right day you will see a few. 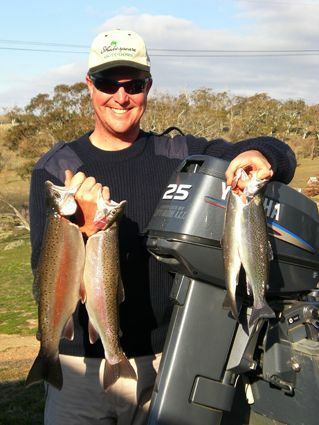 Eucumbene:- Trolling reports have been a little quiet but we have had enough reports to suggest there are still some great quality rainbows to be found around the Old Adaminaby and Buckenderra area. My son-in-law Ben Davis with a couple of fish taken from the Buckenderra area last week. Most taken on the old Alpine special. I fished last weekend myself for five good fish to take home. Two from the bank on power bait (Chunky Cheese & Lime Twist) and three trolling with the alpine special as well. For those who have not been out in the boat from Buckenderra ramp for some time keep a lookout for the rocks as it is getting shallow now. If you stay in the middle of the channel you should be fine but be aware of those nasty rocks. Not just around that area but the lake in general. 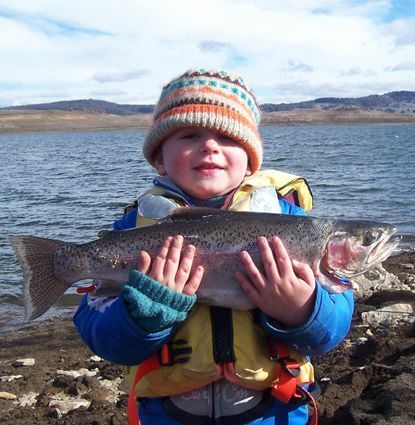 Jindabyne:- Jindabyne has been hit and miss with a few "nothing caught" reports this week. There are still some good fish to be caught in Jinde but early starts are the key to catching them especially when the weather is super calm. Try pink tassies and yellow wing patterns flat line and on leadcore. Rapalas and RMGs around the edges early can also be deadly. Reports suggest that fish have been chasing the goldfish regulalry so using small minnows is a good way to imitate these baitfish. After a long period of nil supply we now have wood grubs back in stock this week. They make a great winter trout bait in the lakes. Eucumbene has picked up with some good fish this week especially from the Seven gates area. Look for soaks and drop offs for best results. The Dam wall area can start to fire at this time of year and is another hot spot to try for some rainbows. Thought I would share this photo with you. My 4 year old son Zacks first rainbow caught on a worm at Midllingbank. 1.3 KG 52 cm long in fantastic condition. Needless to say I dont think I will get away without him wanting to come fishing. *Johnny Scrubworm had a nice session this week after a couple of quiet trips. He landed four nice rainbows on powerbait and scrubworms in the seven gates area. The fish came up an absolute treat in the smoker I'm told.